Java island is famous because of it's fantastic coffee, but you can see beautiful paradise in this tropical island. 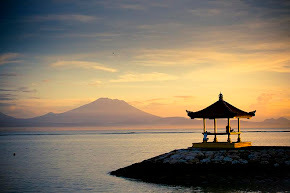 If you have some extra days, don’t forget to visit Java Island. You can see many beautiful places in Jogjakarta, and Central Java. Java is not far from Bali. You can fly to Java or by land. Borobudur temple is so beautiful. Borobudur, the great Buddhist stupa on Java (Indonesia), built and decorated perhaps before 800AD, should be on anybody's list of the ten greatest art-complexes in the world for its size, quality, sophistication and excellent state of preservation. Borobudur located in Central Java and very close from Jogjakarta. You can stay in Jogjakarta, so you can visit a big Hindu temple, Candi Prambanan.